Basically a mansion masquerading as a vacation rental, this property blew us away. 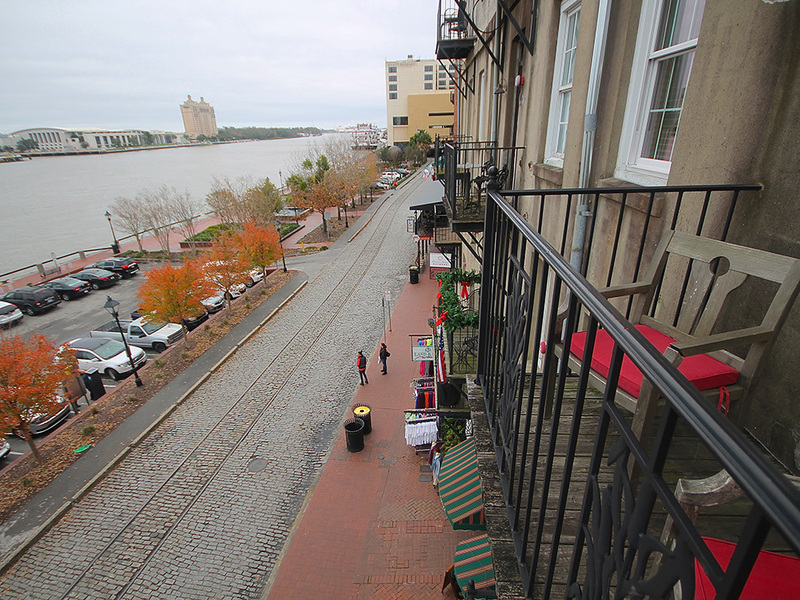 With unobstructed views of the Savannah River, and cobble-stoned River Street below, by far the very best Savannah vacation rental on River Street is the River Street Home. We were feeling spontaneous, and wanted an adventure. We wanted to find a spot to serve as a “home base” downtown so we could go out and be tourists in our hometown. What we found was a property fit for millionaires. In. The. Middle. Of. It. All. Located downtown, the vacation rental is in both the National Historic District, and the “Celebration Zone”. City Market, Paula Deen’s The Lady and Sons, Club One Jefferson, Moon River Brewing, Chuck’s Bar, Churchill’s, Kevin Barry’s and so much more, are all within a thousand feet or less of the house. Every window and balcony at the rear of the property has views of River Street, the Talmadge bridge, and of course water views of the Savannah River. The front windows of the River Street Home have city views and look onto Factor’s Walk and Savannah downtown. Parking is no problem. The house has a coveted reserved space right at the front door! Take three steps from the parking space, and you’re at the double front doors. We walked inside and were immediately impressed by the living room just off the foyer. The custom curved couch underneath the oval tray ceiling faces a fireplace and flat-screen TV. The built in bookcases lined with books made us feel like relaxing after we raided the extensive collection. If the rest of the house wasn’t so awesome, maybe we’d have sat reading and pretending to be fancier than we actually are. Walking the hall towards the river, the exposed brick begs to be touched, and we couldn’t resist running our fingers down the wall as we made our way to the kitchen. Impressive as the kitchen was, nothing can compare to the views of the water right out the windows and the french doors to the balcony. Foregoing the granite counters, the bars, the recessed lighting, and the stainless appliances, we made a bee-line to the balcony. The River Queen was paddling right by, and we fumbled frantically with our phones trying to get the picture. We sat on the balcony for a while, watching people interact on River Street from above and got more than a few jealous glances! The character of the River Street Home is evident everywhere! Off the kitchen, on display in the concrete wall you can see unique pipes that look like something out of a submarine! Exploring the vacation rental continued downstairs, which led us to discover two more bedrooms and bathrooms, more beautiful exposed brick, and another river-view balcony. The house was built at the turn of the century (the 19th into the 20th), and is around 120 years old. A visit to some of Savannah’s antique stores was on our minds, within strolling distance of the River Street Home, we found two of Savannah’s finest. Jere’s Antiques is huge. The multi-floor, multi-room building is a maze of antique heaven. Opened in 1976 and still owned by the same family, the 33,000 square feet we found was filled with some of the most unique furniture in existence. Most impressive was the oak and mahogany bars. They may be $35,000 or more, but you could start your own 1880’s saloon here! There’s another floor dedicated just to chairs. A sea of what seemed like a million chairs going in all directions as far as the eye could see. Most of the items for sale at Jere’s were large, and they mostly sell to other dealers and professional decorators, but the public is welcome to shop here too. At the opposite end of the antique spectrum is Attic Antiques. We wandered across to check them out. Cluttered with cool stuff, for sale we found an eclectic assortment, items such as furs, flatware, license plates, bottles, trinkets, and even a real antique gas mask! After losing track of time, we realized we were getting hungry. We popped back to the River Street Home for some snacks, then walked down the ramp to explore River Street. Pralines. The smell of pralines brought us in the door, the nice lady gave us each one for free. When we left, we had bought enough pralines (and fudge) to feed an entire class of first graders! We popped in and out of some of the bars along River Street, to refresh our to-go cups, and walked along the river, back to the house. It was time to rest. The Savannah River is a major shipping channel leading to the Port of Savannah. We saw many giant container ships coming and going from our balcony, and it was so much fun to watch. Our view from the balcony! Lounging around the vacation home, we watched downtown Savannah go about it’s business in comfort. We tried out the Jacuzzi Shower and the Jacuzzi Tub. We watched TV and surfed the internet. But it was time to go out! So close to the River Street Home we couldn’t resist, we checked out Savannah Smiles: Dueling Pianos. The name of the place really says it all. Two pianos, two players, and the audience gets to decide what they play. We grabbed a bar napkin and wrote down the name of the song we wanted to play, added some cash and had drinks and enjoyed the music until our song was played. This place was a really fun and unique experience. The piano players were amazing. The line for the bathroom was a little long, so we went back home where there was no wait! We wanted something to eat, but it was getting late. We found that Churchill’s serves food until 2am, so we walked down the street. The bar was still rocking, but they seated us at a table. Churchill’s is a bar and a real restaurant, featuring menu items such as “Fish and Chips”, “Bangers and Mash”, and Shepard’s Pie, just to name a few. We had a really good time, and stuffed ourselves, so it was really great that we had such a short walk back to the house! We had a peaceful night’s sleep. Everything was really nice and it was obvious that the Savannah Dream Vacations team had put in a lot of effort to make the place comfortable and guest-ready. We parked the car at the front door when we arrived, and it never moved again until it was time to check out. Everything we did was within super close walking distance. The house was amazing, and the location was crazy convenient. We were the envy of our friends, and anybody that saw us entering or leaving. Having a balcony ON River Street is extremely rare. Having two is unheard of. The River Street Home would be perfect for family reunions or small groups. The place is 3200 square feet on two floors, and the common rooms are perfect for entertaining. The house has tons of character, and the views are extraordinary. If you want to have a vacation in Savannah, the River Street Home is truly the best Savannah vacation rental on River Street. Thanks to Roman and Gitta from Savannah Dream Vacations for making everything so perfect. We can’t wait to stay here again! A bright, airy, open floor plan boasts two full baths and two bedrooms, off the contemporary living area and modern gourmet kitchen. The sitting and dining areas look out onto a wonderful view of Bay Street.